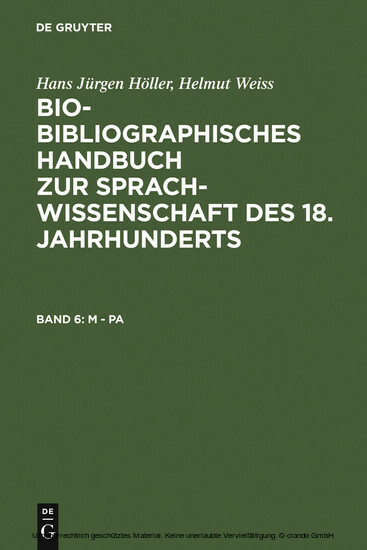 The 'Bio-bibliographical Handbook of Eighteenth Century German Linguistic Scholarship' presents articles on approximately 1600 authors who published works of linguistic interest in German-speaking countries between 1700 and 1800. It will make available for the first time material concerning numerous well-known, but also unknown linguists, which can contribute to an adequate understanding of a fascinating period of linguistic research. - 8 volumes altogether, already published are volumes 1-6.